Server virtualisation is becoming an integral component in the design of IT solutions. This should come as no surprise considering the benefits: reduced hardware costs, simplified management, and improved business continuity. Unfortunately, virtualising your servers is only part of a successful IT strategy. Along with providing key benefits, virtualisation also presents significant challenges with managing storage growth. To fully realise the benefits of a virtual server infrastructure, you need to consider storage as part of the overall solution. Fortunately there's Drobo SAN Storage for Business. Certified for use with VMware and Citrix XenServer, Drobo has been engineered to be both simple and scalable. The integrated BeyondRAID technology delivers enterprise-level data safety with unprecedented expandability, and the "zero click" iSCSI feature eliminates the complexity of adding high-performance storage to your virtual server environment. Drobo allows you to add instant capacity to growing VMs, quickly deploy storage for new VMs, or provide fast, reliable backup and recovery for VMs. If your Virtual Machines (VMs) are constantly running out of storage, let Drobo help you avoid the downtime and expense of adding storage to your VMs. Drobo's Smart Volumes™ offer advanced thin provisioning capabilities usually found in much more expensive solutions. Create new volumes in seconds and manage up to 128 x 16TB Smart Volumes over time with ease. The labor of resizing and migrating volumes is replaced with the simplicity of intelligent engineering. As business requirements change, you need the ability to quickly deploy new VMs. 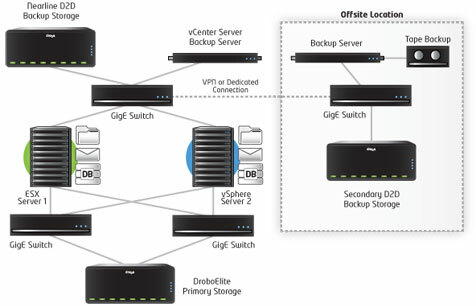 With Drobo, provisioning storage for new VMs no longer needs to be a hassle. Simply create a new Smart Volume on an existing Drobo or deploy a new Drobo in minutes. Attach the Drobo directly to the host or to an available Gigabit Ethernet switch, assign a volume and you're ready to go. Consolidating physical servers by deploying VMs creates backup and recovery challenges for VMs. With fewer physical servers handling more application data, limited bandwidth and compute cycles require increasingly efficient backup methods. Drobo features zero click iSCSI to eliminate the complexity of adding high-performance backup storage to your virtual server environment. Dual disk redundancy can be enabled or disabled with a single click to protect against the simultaneous failure of up to two drives.